Can't remember when I've enjoyed sweet potatoes more. This dish was supposed to be about the chicken, but the sweet potato chunks absorbed the creamy sauce and left me checking the pot for more. Ease into fall with this NYT recipe - use chicken, fish or just vegetables - and you've got Sunday supper covered. 1. Pat the chicken dry with paper towels and season with salt and pepper. Set aside on a plate. 2. Heat the oil over medium-high heat in a 5 qt. dutch oven. Add chicken pieces to cover the bottom, and brown for 6-8 minutes per batch. Add more oil as needed. Transfer to a plate and set aside. 3. Turn the heat to medium, and add the scallion, ginger, garlic and chili to the pot. Stir and cook down until soft, about 1-2 minutes. 4. Stir in curry paste and cook for about 1 minute. 5. 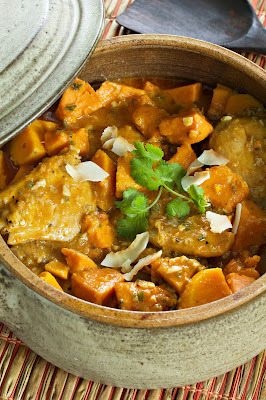 Add coconut milk and sweet potatoes, and stir to combine. Place the chicken pieces on top and add water to come half way up chicken pieces, about 1/2 cup. 6. Bring the curry ingredients in the dutch oven to a boil, cover, and place in a heated oven for about 40 minutes, or until the ingredients are cooked through. 7. Transfer the chicken and vegetables to a platter. Place the dutch oven on the stove and simmer the sauce over medium heat until it reduces to thickened consistency, about 10 minutes. 8. Pour the sauce over the chicken and vegetables, and add garnishes per personal preference.